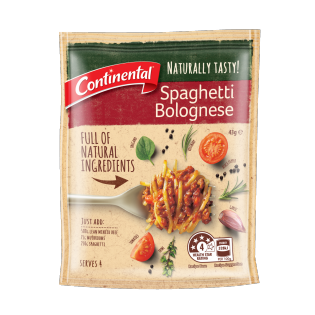 Continental Naturally Tasty Spaghetti Bolognese is a recipe mix full of natural ingredients, so you can create a delicious meal the whole family will enjoy! Vegetables (62%) [tomato (powder, pieces), onion, carrot], sugar, sea salt, spices (garlic powder, paprika, pepper), potato starch, olive oil, herbs (oregano, rosemary, thyme). Allergens:May contain wheat, milk and egg. Just add... 1 tablespoon olive oil 500g lean minced beef 1 cup (75g) sliced mushrooms 1 pack Recipe Base 1 cup (250mL) water 250g spaghetti Preparation time: 5 minutes, Cooking time: 15 minutes 1. Heat oil in a frying pan and brown mince and mushrooms. 2. Add Recipe Base and water, bring to the boil stirring, cover and simmer gently for 10 minutes. 3. Cook spaghetti according to pack directions and serve with Bolognese. Serve with steamed vegetables or green salad. Try your hand at our simple beef macaroni recipe with corn & capsicum. Prepare and cook for the whole family in just 20 minutes. Serves 4. Beef up your Bolognese with Continental Stock Pot. Try this simple recipe for a rich and flavoursome Spaghetti Bolognese. Continental's guide explains how to use cooking herbs to add flavour & colour to your dishes. Learn how to boost any meal with a delicious combination of herbs. One of the simplest and first things you need to learn when cooking is where each meat cut comes from on the animal. This is a great base for pasta, I thought it was the original continental Spaghetti Bol mix, which included a can of tomatoes. but It only included the mushrooms. Not to worry, I added a can of diced tomatoes and it tasted great! all of this range is designed for somebody that cant cook and like magic you can make a delicious dish. simply the best i have ever had out of supermarket packet mixes. I love this product. It ticks all the boxes. It's a great price, intense flavour with balance, and natural. I am truly impressed as it has the perfect umame taste and smells yummy.